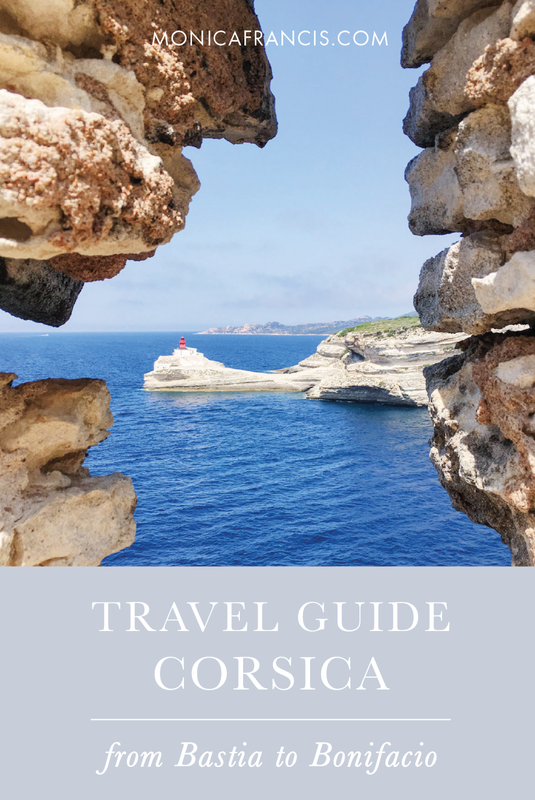 Corsica is a rocky, 114-mile-long island that rises out of the Mediterranean Sea just south of mainland France. It's mostly known as the birthplace of Napoleon, and has been claimed by Italy, Britain, and France throughout its history. Still, Corsica is very much its own - we were assured several separate times that this island isn't really France, even after 200 years of French governance. 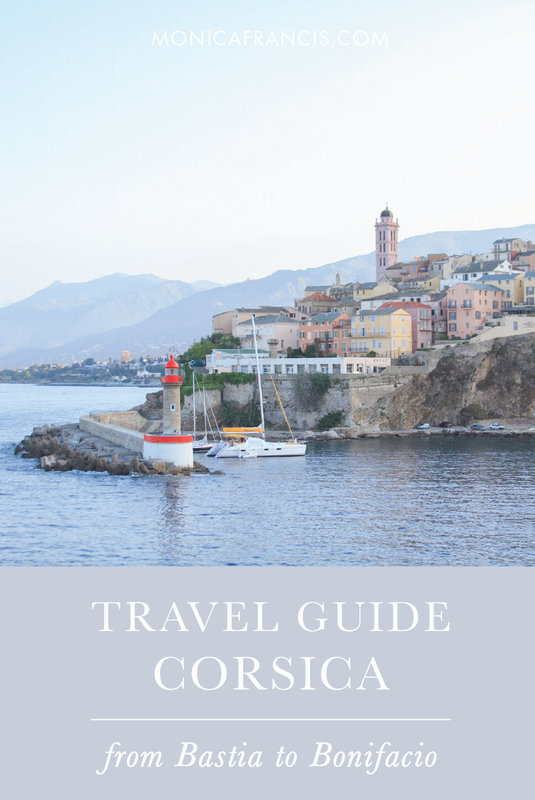 Corsica certainly has its own culture, its own beauty, and even its own language. The rugged terrain is characterized by dramatic mountains, fragrant maquis plants, and incredibly blue water. All around the island you'll find towns tucked among the peaks, port cities dotted along the coastline, and beaches of all kinds. The rest of the island is largely undeveloped except for a few farms and vineyards that produce unique meats, cheeses, and wines. Corsica is also home to the famous GR20 trail, which spans over 100 miles from north to south and is known as the most arduous hiking path in Europe. It's a raw and laid back environment compared to the hyper-developed Côte d'Azur, and a more exotic destination to see - wild, skinny cows even roam the northern beaches - but all of its uncommon allure also adds up to a fairly challenging visit. Transportation to and around Corsica is the first obstacle to negotiate. While there are a few trains and bus lines, you really need your own ride to see everything. Rental cars on the island are costly and, combined with an expensive flight (depending on your starting point), might exhaust your budget. We found it was much more affordable to rent a car on the mainland and bring it with us on a ferry to Bastia, returning the car when we got back to Nice. When you arrive in Corsica, be prepared for an experience in immersion language learning. Corsicans speak French and some speak Corsu, but you'll find very few people who speak or understand English, especially in the northern part of the island. Take the time to practice your French and download a translation app to your phone. Despite the language barrier, all the Corsicans we spoke with were patient and friendly. I know enough French to politely order a pastry (I consider this a survival skill), but was quickly out of my depth when we had to visit the local police station to recover our mysteriously towed rental car. After a few minutes of miscommunication, we all resorted to translating important details on our phones and were quickly on the same page. Once you're ready to start exploring, the Scandola Nature Reserve will likely be at the top of your list. It's famous for striking red cliffs that form perfect grottos and inlets for snorkeling or scuba diving, as well as eucalyptus and olive tree forests to the south. Sadly, we made the mistake of not booking a boat in advance and arrived in Galéria to discover that all the sailings were full. We couldn't make the journey back the next day, but I'll share some advice: book at least one day in advance, depart from Porto or Galéria, bring your camera and bathing suit, and choose a 2-3 hour tour that includes a stop for snorkeling. Leaving Galéria, it wasn't hard to make the best of our drive through the mountains and along the coast. If you're already in the northwest of Corsica, drive the Artisans' Route for spectacular views and noted stops to discover some of the island's best craftsmanship. Perched in the mountains in the heart of the island, Corte is a quintessential Corsican town. Walking through the stone streets, you'll notice that it's clearly European - colorful buildings and shutters, narrow lanes, plenty of fountains and flowers - but with its own distinct flavor. At the top of the citadel, the Museum of Corsica is housed in an historic fortress. The city itself spills down the hillside, full of shops and restaurants. Following Garance Doré's advice, I stopped at Pâtisserie Casanova for a delicious falculelle - a kind of cheesecake cookie baked on a chestnut leaf, a Corsican speciality. For dinner, take in the views from U Museu, explore the wine list at Le 24 or tuck into a more casual meal at Le Bip's. Bonifacio sits at the Southern end of the island, on tall limestone cliffs that fall sharply into the blue water below. This ancient town is home to the largest church in Corsica, the Église Saint-Dominique, as well as striking natural colors and arguably the best seaside views. Plan for plenty of photo stops as you follow the city's outer wall along the coastline, and make your way to the King Aragon Steps that climb down to the water. If you're looking to escape the sun and wind for a while, head down to the port of Bonifacio. Walk along the marina to find a shaded café for lunch, then take an hour-long boat tour for a more panoramic experience of the cliffs and the city - many of the well-known photos of Bonifacio are actually taken from the water. Just northeast of Bonifacio is the charming port town of Porto Vecchio, and it's easy to see why this is a favorite vacation spot. The village itself is pretty, and more developed than any of its neighbors. Some of the best beaches in Corsica can be found here, including Plage de Palombaggia. The soft white sand and clear, shallow water is the stuff of island dreams. Because this is a popular summer spot for European vacationers, reserve a lounge chair or a spot for lunch or dinner ahead of time - or plan to pack a picnic and roll out your turkish towel in the sand. A bit inland from Porto Vecchio is the Alta Rocca region. Head west into the scenic countryside where you can hike among the area's many gorges, waterfalls and rivers as well as the last portion of the GR20. If you have more time, drive further into the mountains to explore the valleys and villages. All images are original, please use only with permission.